What do you get if you put 42 teenagers on an island, and tell them to kill each other? One heck of a movie, that's what! If for some strange reason this is the first time you hear about this film, you'll probably be thinking something along the lines of: "No, it can't be. Nothing can be this awesome!" But actually it is even more awesome than you imagine! There's best friends betraying each other, enemies having their final showdown, and confused crushes surfacing as hormone-crazed kids take their last gasps. 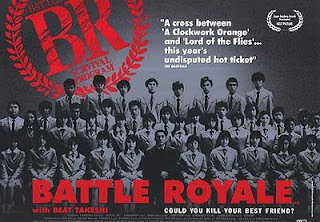 Beat Takeshi stars in one of his best roles, as the never flinching headmaster of the whole inferno, and he puts on such a show you'll have trouble containing your laughter, as the kids die one by one. Battle Royale is a rather rare example of the film actually being better than the novel it is based on, and the "best film of the last 17 years" according to Quentin Tarantino. Don't bother with the sequel though. Director Kinji Fukasaku died halfway through filming it, resulting in a mess of a movie. This is another of my favorites. Got the special box set as a birthday present to myself this year. Cool. Was there any cool extra goodies in the box? I read the book last year, which was also quite alrite. Oh yeah. Loads of em. It took me hours to sift through everything.